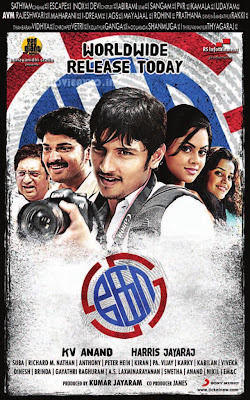 Plot: Ashwin(Jiiva) is a photojournalist for a Tamil Daily, "Dina Anjal", he is super popular for his great pictures. There are also other journalists for the daily, Saro(Pia) who is in charge of the entertainment section; and Renuka(Karthika) who covers sensational news. (You guessed it! Triangular Love Story) Elections are coming up in TN, and the two major canidates are : Yogeswaran(Prakash Raj), and Alavadhan( Kota Srinivas Rao); they do anything they can to "win" the hearts of the people. Ashwin and Renuka uncover their true colors to the society, which helps Vasanthan(Ajmal) and his party, get popular among the masses. As people, concentrate more on him, he ends up winning the people with his good deeds; since he actually wants clean politics. Sadly during a Election rally a bomb goes off and Saro ends up dying. Now its up to Ashwin and Renuka to find the people behind it. The Climax is shocking. 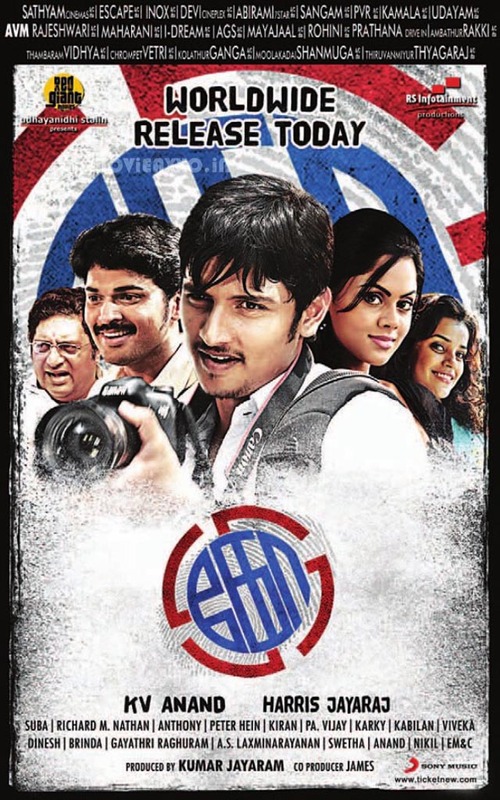 Performances:Jiiva, seriously poured life into his character, it was like tailor made for him. He scored well in everything from romance to comedy to fighting to emotions. Pia's character was totally made FOR her, she portrayed it so well. Saro is definitely her best performance till date. Saro leaves a mark our hearts, with her bubbliness and cuteness. We can't help but, feel sad,and tear up for her. Karthika was gorgeous,and performance wise too she did well. She couldn't have had a better debut than this. Jiiva had sizzling screen chemistry with both,Pia and Karthika, which doesn't happen to all actors. Ajmal was VERY convincing in his role. Everyone else, didn't have a major part but were there and did well in there small roles,like Prakash Raj,Kota Srinivas Rao, Bose Venkat. Pattimandram Raja had a blink of an eye role. K.V Anand proves,once again, that we can't go wrong with his movies;there always so classy. Everything is so fine, casting, music,direction,cinematography,editing, everything. The Cinematography adds to the intensity of the film. The stunts, Oh my god. They were so freaking cool and stylish. Jiivas opening in the film was super cool! Special Mention to Peter Hein! The theme of the film is the daily life of a Photojournalist. But it doesn't stop there, Politics is laced into the film, along with journalism. The film is intense which makes it even better. 180 releasing on June 25th! Richa to share screen space with STR!